A rare photo of one of the early table reads for Boardwalk Empire, back when Ethan Hawke was set to play Nucky Thompson. He’s no Steve Buscemi, sure, but it might have worked. Sidney Lumet’s final film is a well made but unpleasant crime drama featuring an excellent cast – the late great Philip Seymour Hoffman, Ethan Hawke, Marisa Tomei, Michael Shannon, etc. – who all play people I’d rather not spend time with, thanks very much. Lumet tells the story in non-linear fashion, showing us the same scenes several times in order to change from one character’s perspective to another’s. Presumably this is intended to give the audience greater insight into what’s going on; however, in practice we end up gaining almost nothing every time, so the exercise seems pointless. Still, the performances are uniformly solid and there are a few moments of truth and emotional depth (though not nearly enough to warrant a recommendation). 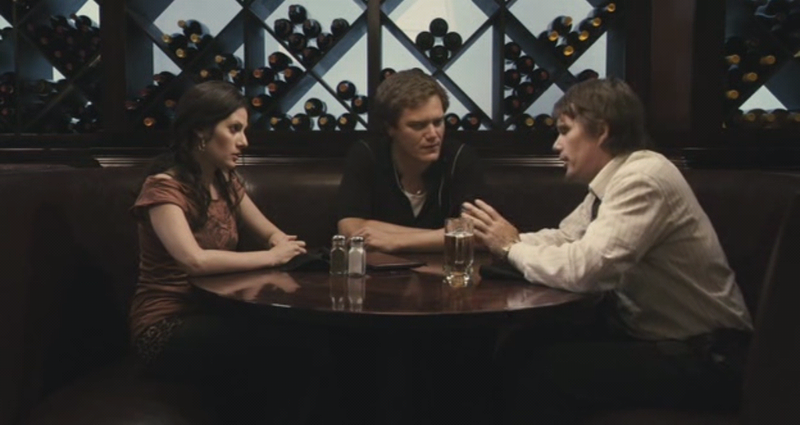 This entry was posted in 2007, 6, Reviews and tagged Albert Finney, Before the Devil Knows You're Dead, Crime Drama, Ethan Hawke, Film, Marisa Tomei, Michael Shannon, Movie Reviews, Movies, Philip Seymour Hoffman, Sidney Lumet on March 13, 2014 by moviesandbacon.